The important roadways, railway routes, countries and state surrounding the place, capital city and towns are prominently highlighted in the New Hampshire Map. 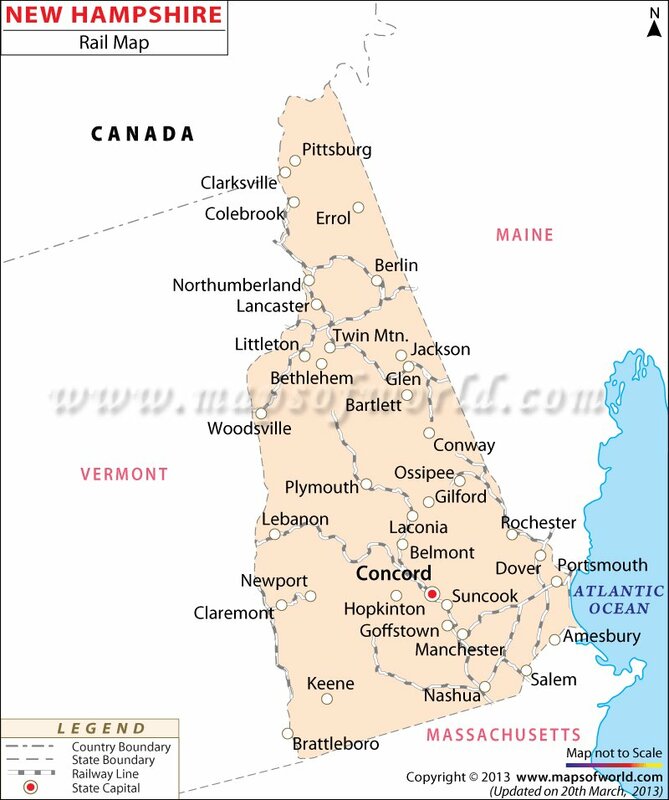 Concord, the capital city of New Hampshire is pointed out in the map of the state. Also, the towns such as Plymouth, Nashua, Glen, Brattleboro, Rochester, Lebanon and Newport are defined in the New Hampshire map. New Hampshire state is placed on the northeast of United States in New England. Drained by Merrimack river, Connecticut river and Androscoggin river, New Hampshire has 741 sq km of inland water area. Out of the total area of 24, 033 sq km, New Hampshire has 23, 292 sq km of land area. The routes through which interstate 95, interstate 93 and interstate 89 pass are clearly indicated in the New Hampshire map. The railway tracks of New Hampshire which are mainly serviced by Amtrak trains are also defined in the map. The New Hampshire state map is also a helpful guide which illustrates political, physiographic and historic places of interest. Maine, Canadian province of Quebec, Vermont, Atlantic Ocean, and Massachusetts, surrounding the state, are also marked in the map of New Hampshire. An all-encompassing overview of the state can be found in the New Hampshire map.